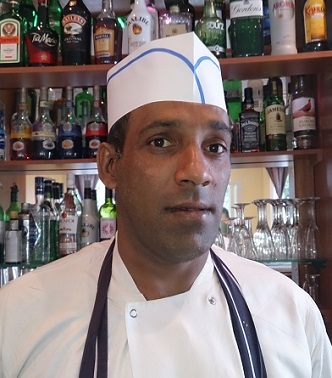 Our Head Chef, G.D. has an extensive knowledge of authentic Indian and Nepalese food. He obtained training in HYATT REGENCY HOTEL (5 star ) in Nepal. In 1996 he moved to New Delhi and worked as a Chef in 3 Star CAPITAL RESTAURANT for 4 Years extending his knowledge of various cooking styles of whole India. He enhanced his expertise on a move to Dubai, working for 5 years at REGAL RESTAURANT & BAR (3 Star Indian Cuisine). From Dubai he was invited to join the team in well-known Michelin starred TAMARIND Restaurant in Mayfair. As a home of authentic Indian cuisine, they have won numerous awards including the MICHELIN STAR for many years. From this extensive background of Indian cooking G.D. can prepare, given notice, most dishes from the sub-continent. We feel honoured to have him and his entire team, at CAMBERLEY TANDOORI & BAR, 469 LONDON ROAD. We hope to exceed your expectations with the best quality food and excellent service. We welcome you to our Restaurant, Camberley’s home of authentic Indian & Nepalese cuisine! Our decor is in style of Rajisthan (India) from real paintings to fabrics & curtain material. Our chef , G.D. has vast knowledge of most spices from the foothills of the Himalayas in Nepal to the major spice growing area of Tamil Nadu, South India. We invite you to try an aperitif or cocktail (many well-known varieties can be mixed for you) in our reception area before dining. Our aim is to give you an enjoyable, authentic Indian & Nepalese experience !! © Copyright . 2019 All rights reserved.